The Victorian bushfires of February 2009 captured the attention of all Australians and made headlines around the world. One hundred and seventy-three people lost their lives, the greatest number from any bushfire event in this nation’s history. In the wake of this tragedy much media and public commentary emphasised recovery, resilience, community, self-sufficiency and renewed determination. Peg Fraser, working as a Museum Victoria curator with survivors in the small settlement of Strathewen, listened to these stories but also to other, more challenging narratives. 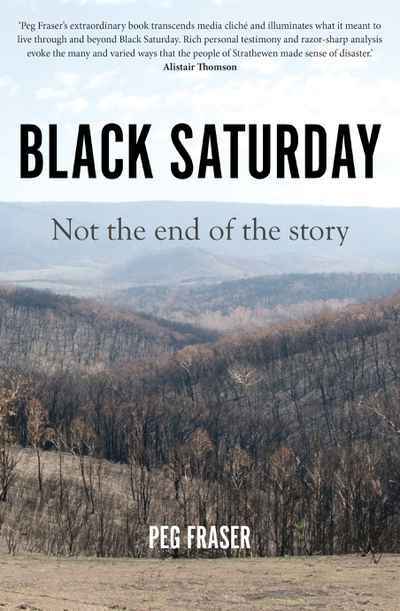 The memories and thoughts that Fraser heard, and gives voice to in this book, complicate much of what we thought we knew about the experience of catastrophic natural events. Although all members of the same community, Strathewen’s survivors lived through Black Saturday and its aftermath in ways that were often very different from each other. Beginning each chapter with an object from the bushfires – among them a Trewhella jack, a burned mobile phone, a knitted chook and a brick chimney – Fraser explores and reveals how each person’s identity, including as a man or a woman with a particular social position in the town, impacted upon experiences and understandings of loss, survival and even the future. This is historical truth of the most vital, affecting and powerful kind.